Bio: Rahim Tafazolli, Regius Professor in Electronic Engineering. This royal recognition was awarded to mark the Queen’s Diamond Jubilee. Rahim Tafazolli has been a Professor of Mobile and Satellite Communications at the University of Surrey since April 2000, the Director of Institute of Communication Systems (ICS) since January 2010 and the founder and Director of the 5G Innovation Centre since 2012. The world’s first dedicated centre on 5G research and innovation. He has over 30 years of experience in digital communications research and teaching. He has authored and co-authored more than 500 research publications and is regularly invited to deliver keynote talks and distinguished lectures to international conferences and workshops. In 2011, he was appointed as a Fellow of the Wireless World Research Forum (WWRF) in recognition of his personal contributions to the wireless world as well as heading one of Europe's leading research groups. He was also awarded the 28th KIA Laureate Award- 2015 for his contribution to communications technology. Abstract: This talk will focus on emerging technologies and middleware for designing next-generation clusters and data centers with high-performance and scalability. The role and significance of RDMA technology with InfiniBand, RoCE (v1 and v2), and Omni-Path will be presented. Challenges in designing high-performance middleware for running HPC, Big Data and Deep Learning applications on these systems while exploiting the underlying networking features will be focused. An overview of RDMA-based designs for Spark, Hadoop, HBase, and Memcached will be presented. On the Deep Learning side, RDMA-based designs for popular Deep Learning frameworks such as TensorFlow, Caffe, and CNTK will be focused. The talk will conclude with challenges in providing efficient virtualization support for next generation clusters and datacenters with CPUs and accelerators. 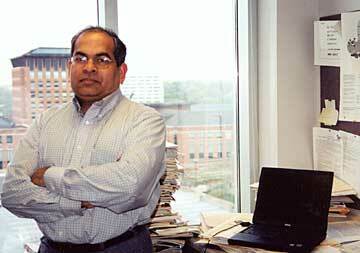 Bio: DK Panda is a Professor and University Distinguished Scholar of Computer Science and Engineering at the Ohio State University. He has published over 450 papers in the area of high-end computing and networking. The MVAPICH2 (High Performance MPI and PGAS over InfiniBand, Omni-Path, iWARP and RoCE) libraries, designed and developed by his research group (http://mvapich.cse.ohio-state.edu), are currently being used by more than 2,900 organizations worldwide (in 86 countries). More than 473,000 downloads of this software have taken place from the project's site. This software is empowering several InfiniBand clusters (including the 1st, 9th, 12th, 17th, and 48th ranked ones) in the TOP500 list. The RDMA packages for Apache Spark, Apache Hadoop and Memcached together with OSU HiBD benchmarks from his group (http://hibd.cse.ohio-state.edu) are also publicly available. These libraries are currently being used by more than 285 organizations in 34 countries. More than 26,600 downloads of these libraries have taken place. A high-performance and scalable version of the Caffe framework is available from http://hidl.cse.ohio-state.edu. Prof. Panda is an IEEE Fellow. More details about Prof. Panda are available at http://www.cse.ohio-state.edu/~panda. Abstract: Parallel programs to store and manipulate Big Data have already embraced the transport offloading provided by RoCE - RDMA over Converged Ethernet. Recent NIC enhancements enable RoCE deployments even on non-Converged Ethernet. But the power of NIC hardware acceleration extends beyond that of Remote DMA. For example, enabling Kernel Bypassing provides great advantages compared to the traditional networking as Microsoft demonstrated lately the ~6usec end-to-end latency achieved by VMA. In this talk we will be highlighting 3 such new results: Kernel bypassing enhanced with Direct Application Data Placement is now providing a 10x bandwidth increase to video processing. Acceleration of the networking functions, traditionally part of the Virtual Switch software, by the ASAP2 technology show great results providing load balancing, DDOS mitigation, NAT services, and alike. Finally, we discuss Network Computation offloading and demonstrate how NIC level communication primitives offloading accelerating distributed DNN learning. Bio: Dr. Eitan Zahavi, a Distinguished Architect and co-founder of Mellanox. Eitan leads the Mellanox network architecture group focusing on cluster level performance. He also acts as a co-chair of the IBTA technical working group. Dr. Zahavi teaches Logic Design Automation for VLSI systems in the Technion EE department. He received his Ph.D. about “Forwarding in Compute Clusters” in 2015 and Bs.C. in 1987 both at the EE department of the Technion, Israel institute of technology.